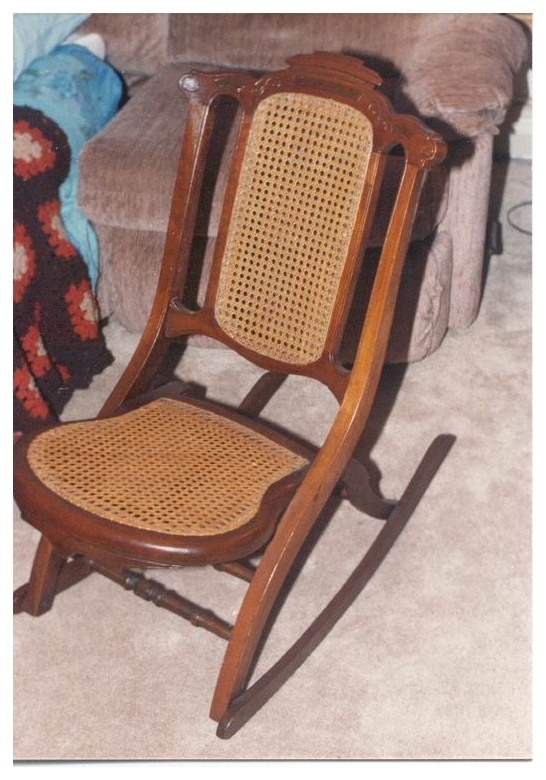 Invention of First Folding Rocking Chair in U. S.
How much room would a rocking chair take in a covered wagon? Plenty, when space was of great necessity. How about a Collignon folding rocking chair? How much room would that take? Very little, because folded it was in the shape of a quarter moon. 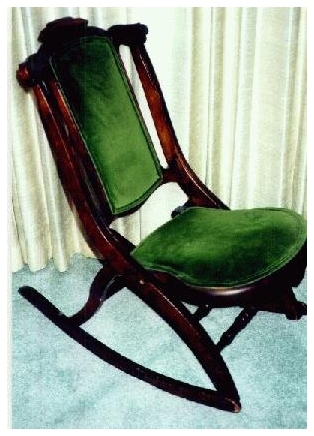 Nicholas, Claudius, and Adam Collignon invented the folding rocking chair March 10, 1868. There were many other variations invented. Regular folding, deck, lawn, and variations of these. 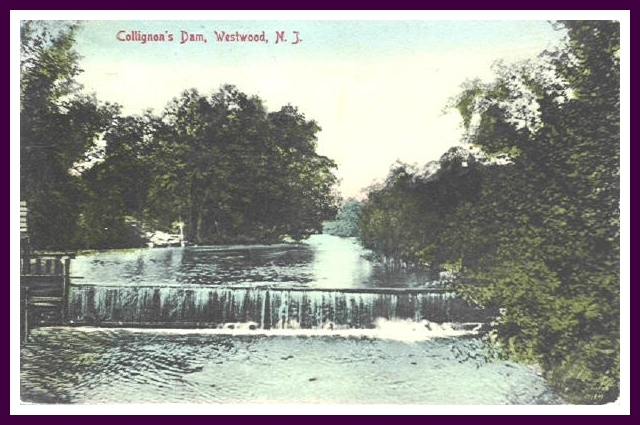 The whole town of Westwood New Jersey, (now River Vale) in Bergen county, worked at the factory on the Hackensack river. THE CHAIRS CAN BE IDENTIFIED BY LOOKING ON THE BOTTOM OR BACK FOR THE COLLIGNON NAME AND PATENT DATE. 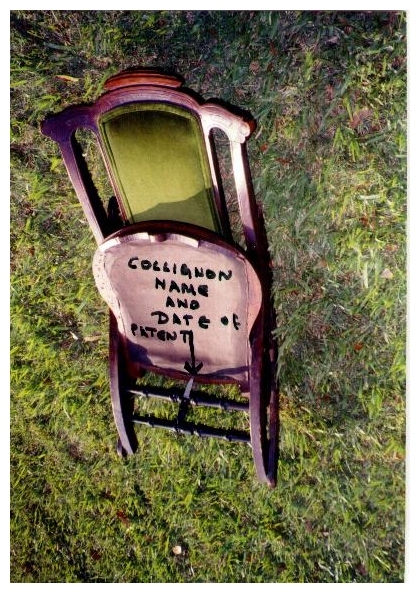 "IF THERE IS NO NAME AND PATENT DATE IT IS NOT A COLLIGNON CHAIR!" If you find one please email me, I would like to know how far they traveled. We found a folding deck chair in Fredericksburg Texas. That's a long way from New Jersey! I must share some exciting information.! A COLLIGNON folding deck chair (patent 1871) has been located in Canada by Mathieu Belanger! I never expected this to happen so quickly. The chair was completely refinished to this original state by Mathieu and his wife. What a fantastic job! It looks beautiful. The wood is black walnut. We were able to supply our friends with a nice poster of the many other different styles of folding chairs. I will try to reduce this poster and display it on our page. Keep tuned! We may find more! I Found one! Well, My cousin Ellis found it, and asked if I wanted it, and I did. It was found in New York at an antique store. Someone covered the seat and back in a beautiful green upholstery. Some day I may have it caned as it was done originally, but right now, I am excited just to have one. My Collignon Folding Rocking Chair. Patent date is March 10 1868 - November 16 1869. Here is the poster of the many chairs manufactured by the Collignon Brothers. There are two views of each chair, one open and one folded. The man with the white beard in the center of the bottom picture is one of the inventors, Claudius O Collignon. They were photographed in front of the building where the chairs were made. 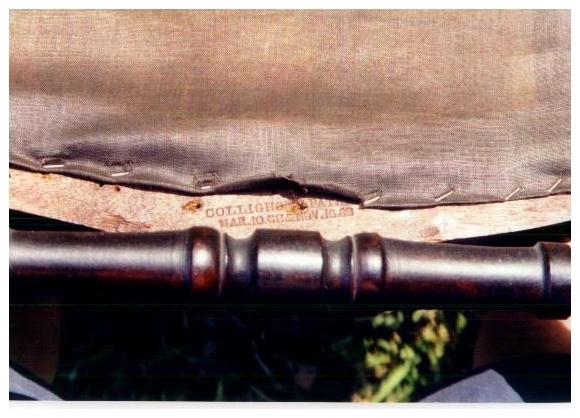 Remember, the name COLLIGNON and the Patent date was stamped into the wood on the under side of the chair. The types of wood that they used to make these chairs were maple, black walnut, and birch. Peter (Pierre) Collignon, born September 22, 1799. came to the United States in 1825 from Rupt en Woevre, France. He married Mary Perrin, also from Rupt en Woevre, and had ten children. Catherine Barbara (b. 1825), Nicholas (b. 1829), Claudius Ottignon (b.1830), Elizabeth Mary (b.1832), James Peter b.1834), (my descendant) August Martin (b.1835), Leonard Perine (b. 1837), Adam (Ellis III's descendant) (b. 1839), Jane Ellen (b. 1842), and Victor born 1843. 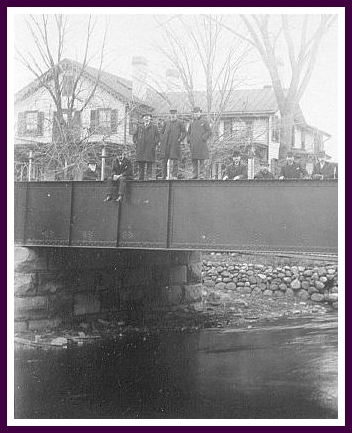 In 1831 Peter moved his family to Bergen County, New Jersey from New York City. It is here in Bergen County on the Hackensack river, that the first Collignon chair factory will be built. This picture was the centerfold advertisement in a catalogue issued circa 1880. It is an artist's rendering of the Collignon Brothers Chair Factory and dwellings situated on Westwood Avenue by the Hackensack River at Leslie's Bridge. The factory buildings were all destroyed by fire in 1904. 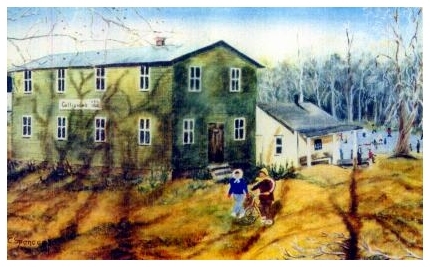 The Nicholas Collignon House on the lower right of the picture burned in 1943 when it was the home of the Leslie family. The Claudius Collignon House, top center of the picture, is the only remaining dwelling from the Collignon Manufactory. In 1855 Nicholas returned to New Jersey from a search for a quick fortune in the gold mines of California during the 1849 " gold rush", and in the quest of building a ship yard in San Francisco. (The biographical sketch, from which this material was taken, said he built the first American vessel ever built on the Pacific coast. He named it the "Maria Mitilda," and it was the fastest sailing vessel on the coast. I could never substantiate this, and if anyone does please email me. Thank you.) 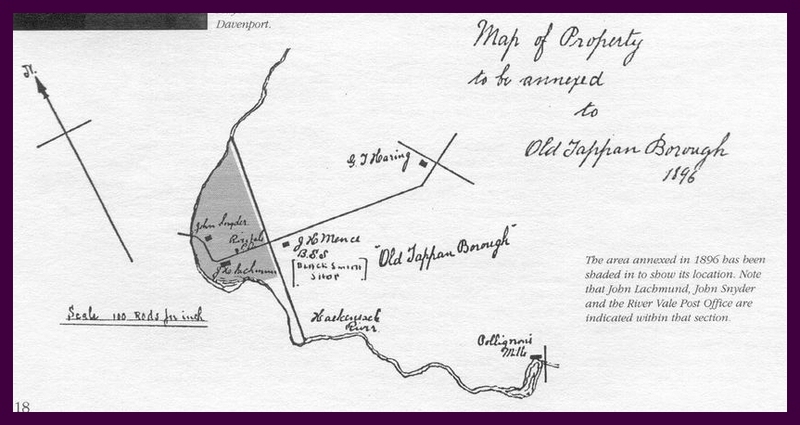 Upon his return, Nicholas formed a partnership with his brother Claudius, and they purchased a large mill property on the Hackensack river two miles east of Westwood. It is here, in 1857, that the first factory is established. 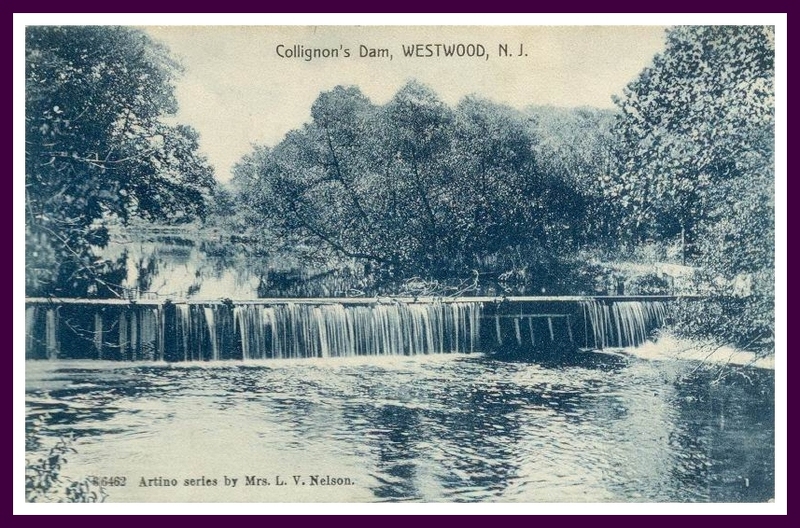 The quality of their work created a demand which had rendered an extension of their establishment a necessity, and they expanded to both sides of the Hackensack River at the bridge, on what is now Westwood Avenue at the Old Tappan boundary. In 1858, Adam returned to New Jersey from the Brooklyn Navy yard in New York and joined the partnership with Nicholas and Claudius. He remained with them for 10 years and had a dispute with Claudius about a chair patent. 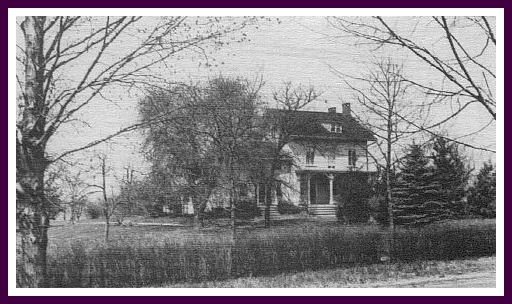 In 1868, Adam dissolved the partnership with his brothers, and bought property at 234 River Vale Road. Here he started his own chair factory about a mile west of the original factory. They made a specialty of folding chairs, which were protected by fifteen different patents. They are the makers of the first folding-rocker in the United States, patent 1875. This design most probably resulted from Nicholas's 1849 trek to California during the historic "gold rush" days. Traveling by the typical Conestoga wagon, he noted that families most always had a rocking chair with them for the young mothers to rock their babies. With space limited, the cumbersome rocker would be tied in some fashion to the outside of the wagon where it would knock steadily and rhythmically against the side throughout the trip. The chairs were so popular, and the demand so high, that additional properties were acquired. The property was primarily woodland from which the black walnut, maple, and birch logs used in the chair making business were obtained. 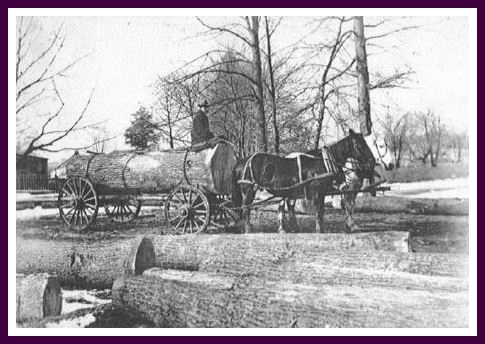 It was no uncommon thing, in those days, to see 7 or 8 teams following one another, bringing logs to the mill and wagons taking the finished chairs away for shipment. At one time as many as 100 men were employed in various departments of the business, besides the women and youth who wove the cane chair seats and backs at home. The census records bear this out, because it shows almost everyone in Bergen County employed by the chair factory. The women and children received 25 cents per seat or back. Think of the many holes in the seat made by the cane weave. Today (1999) to purchase a seat or back made from hand woven cane, you will pay three dollars a hole. And you thought the price of bread went up! The first Collignon chair factory was in business from 1857 to 1896 (39 years.) At the height of the business thousands of deck chairs were sold to several steamship companies including Ward, Cunard, Panama, and the Pacific Steamship Company on the West Coast. A serious blow was delivered to the company's trade in 1890 when Great Britain's labor regulation demanded that all equipment aboard English registered vessels must be the product of British workmen. The factory Adam started in 1868 was operated until his death in 1931 (36 years). Many fond memories bring smiles and damp eyes to the Collignons and neighbors that lived near Adam's factory when they remember the many hours during the winter they skated on his frozen pond. The pond was dug to provide steam to turn the lathes and saws at the chair factory. This might have been the industrial need, but for the kids of every age during the winter, it was a way to have fun and to be with friends. 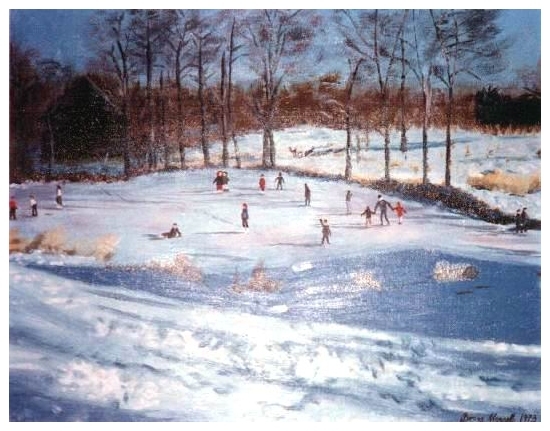 This is a picture of the Collignon Chair Factory and pond painted by Catherine Spencer. Her great grandfather was Adam Collignon, one of the inventors who built and worked in this factory. Catherine painted this picture as she remembered it from her childhood. Catherine had some lithographs made for one of our family reunions, and now we are thinking of making one available to any one who would like to purchase one. Please email me so we can get an idea of the interest in this. Thank you. I was born in 1926 and spent my youth surrounded with family history and did not appreciate my surroundings until they were gone. However the memories are still with me which I shall share. My home was at the top of the hill on the left of my painting. It still stands and is now over 200 years old. 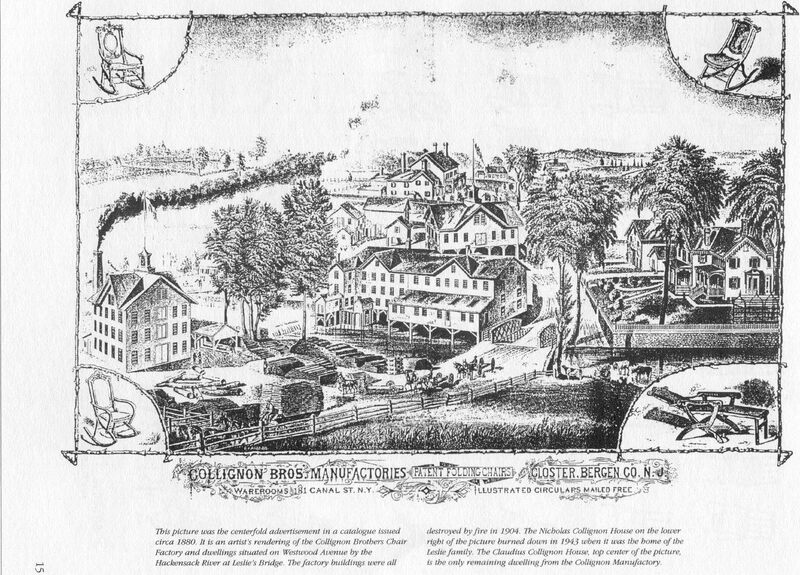 The large pond spread behind the two buildings, the chair factory and the small white building was the "CIDER MILL". This home and land were our recreational area during the "30's". By 1940 we were young adults with the war years ahead. My grandfather, Ellis M Collignon Sr., his five children with their families all lived in the immediate area. We totaled 20 members and during the winter months the hill and pond were the play ground for family, friends and residents of the neighborhood. In autumn the cider mill was busy and after the first crushing of apples my mother sent us to the mill to drink the cider because it was "good for what ailed us". We removed the dipper from the nail on the post of the press, dipped it into the large barrel catching the cider, without disturbing the 4 to 6 yellow jackets now sitting on the edge of the dipper, had our first drink of the season. I was never stung! Once during a very cold, windless, night the temperature dropped severely and the first ice appeared on the pond by morning. After a few more days of freezing weather we were anxious to skate. For the first and only time in my life the pond ice was like a sheet of glass. As you skated upon the ice one could see the water and weeds move and watch the fish swim by; very frightening to a youngster! When snow arrived it increased the activity for now we could use our sleds, coasting down the hill, at a good speed, hit the pond and race across, up the bank at the far side and finish up between the trees. "A good run". It was skaters beware when the sleds were on the pond for steering on the ice was next to impossible. One cold, January, week we were able to witness the "Northern Lights" when skating at night. I have never seen the spectacle again. Wood contributions appeared like magic under the big tree where a fire warmed many hands and feet, especially at night. As we aged and our skating improved we would put on our skates in the warm house and almost fly down the hill and onto the ice with nary a spill. Few skaters would join us in this feat! An almost non stop hockey game was in progress at the far end of the pond and I was usually recruited as a "goalie". This ended when I received my first pair of figure skates and I was more interested in becoming Sonja Henie, the second. In summer, only "the kids" were allowed to fish the pond with bent pins for hooks and bread dough balls for bait when we were to lazy to dig for worms. Of course all fish were returned to the pond. Baseball games in the empty lot by the factory and hide and seek were the games for summer evenings. A large cement area around the house was used for "hop scotch" or jump rope. A year round play ground in our back yard. As children we were not allowed into the old factory. But whenever my father checked the factory building I usually followed and remember being quite scared to climb the large open stairway (without hand rails) to the top floor. There were suspended large wooden wheels with wide leather straps disappearing through holes in the floor to smaller wheels on the lower floor which than turned the machines tools for constructing parts for the chairs. In the fall when operating the cider mill my grandfather would open the back door of the factory and sit in his chair in the sun. On my way home from school this gave me an opportunity to check out the lower floor. Fascinating! After the war we also settled in the area and our children enjoyed the pond and area. We are now grandparents living in various parts of the country. The pond and buildings are gone and now apartment buildings occupy the land and a way of life as we knew it is gone forever. 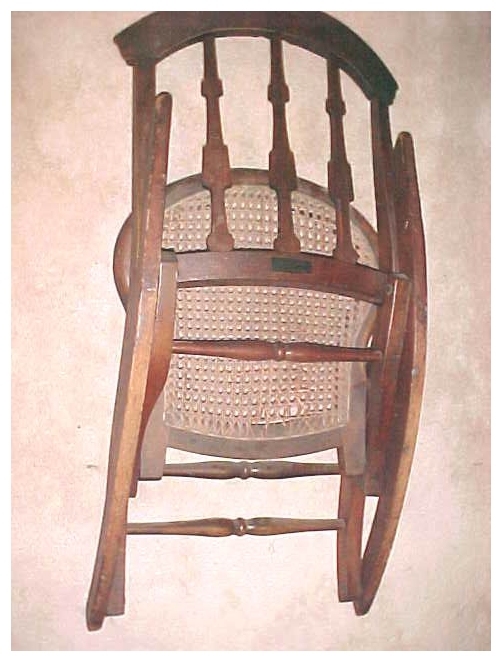 Among the several museums fortunate enough to own a Collignon chair are the Smithsonian in Washington, the Winterthur Museum in Delaware and, of course the Pascack Historical society. In 1818 when George Brinkerhoff became the owner, Mill Lane (as Westwood Avenue was known then), was a dead end road. 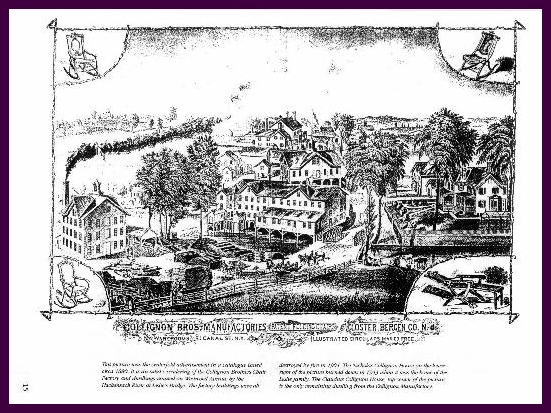 In that same year it was extended over a new bridge across the Hackensack River and southerly through the land of Peter Merselis, whose brother Jacob had built a grist mill in 1800 further up the river near Old Tappan Road. 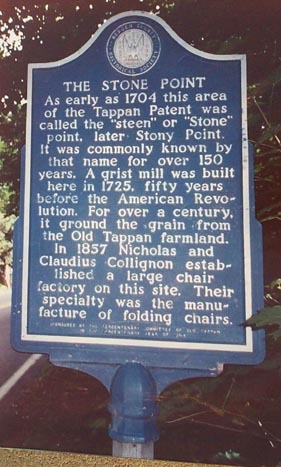 Peter and Jacob Merselis were grandsons of John Flierboom, one of the early settlers of the Tappan patent. There then followed a swap in 1827 between Brinkerhoff and Jacob Merselis, each buying the other's property for the same sum - $3000. The Brinkerhoff mill passed through many hands as a grist mill, eventually ending as Hasbrouck's cider mill in the 1870's. 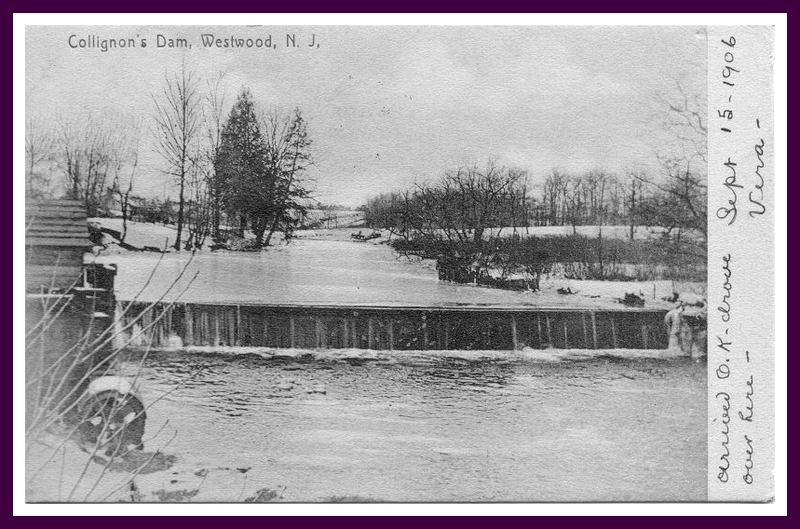 Its foundation and dam are still visible at the Hackensack River downstream from Luchmund's Bridge. Jacob Merselis sold his new mill and property to John Humphrey and his son, William, in 1839. The Humphrey's started a chair factory as a sideline to the milling business and operated it until their deaths in 1849 and 1850.Their estate was settled and the properties sold to Isaac I. Cole in 1851 for $3560. 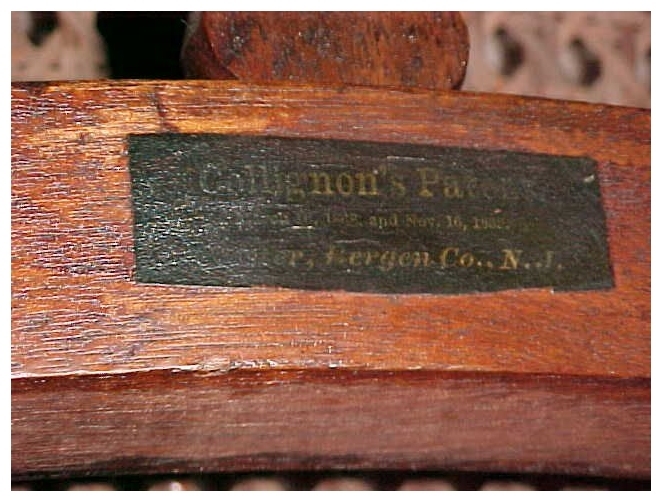 On April 16, 1857 Cole sold the site to Nicholas Collignon, who with his brother Claudius, established the largest chair manufacturing mill in the State of New Jersey. Nicholas married Catherine Demarest in 1855. His brother Claudius married Sarah Cleveland, niece of Isaac I. Cole. 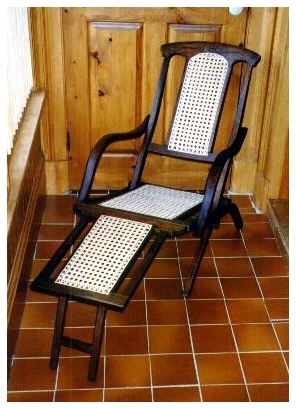 From the design of Nicholas and another brother Adam (who later established his own chair factory in River Vale) this firm patented and made a specialty of folding wooden chairs, including the first folding rocking chair in the country, which was reported to "enjoy a great popularity." Part of their production was steamer chairs for use on ocean going vessels, especially those of the Cunard Steamship Line. This enabled the firm to expand its market abroad. Mill buildings were enlarged, supplementary steam power was installed and additional woodland properties were acquired from which the black walnut, maple, and birch logs used in chair making were obtained. At one time as many as 100 men were employed in various departments of the business, besides the women and youths who wove the cane chair seats and backs at home. Chairs for children were made in a small-sized version. In 1873 the firm established an office and principal shipping warehouse at 181 Canal Street in New York City. Prior to the coming of the railroad through Pascack valley, the chairs were taken by wagon to Closter for shipment by the Northern Railway to New York. Nicholas Collignon returned home safely, but wounded, from the Civil War on June 25, 1863 after serving with the 22nd Regiment of the New Jersey Volunteers. These wounds affected his health for the rest of his life. Nicholas Collignon died in 1879, his estate selling his half of the manufactory to his brother Claudius. Its market became curtailed, however, when a change in England's laws required that the furnishings used in English ships be manufactured in that country, resulting in the loss of business from a number of steamship lines. The competition from other furniture manufacturing firms, including that conducted by Adam Collignon at River Vale, and the expiration of their patents, also hurt this local industry. Claudius Collignon died in 1891 and left his entire estate to his widow, Sarah Cleveland Collignon, who sold the business to their son, Peter C. Collignon. Peter continued with diminishing success, mainly due to large indebtedness. In 1895 he suffered foreclosure and the property was bought in a sheriff's sale by Hiram Bellis of Oradell, an agent of the Hackensack water Company which was then acquiring considerable land along the river for watershed purposes. The buildings and machinery were leased by the Water Company to Thomas Jefferson Post, a former employee of the Collignon firm. He continued the manufacture of steamer chairs until 1904 when fires destroyed the main buildings, materials and machinery. Nicholas Collignon built his home on the east side of Westwood Avenue close to the river. It was a large, comfortable house with wide porches much enjoyed by the Leslie family who came into the ownership of this property around the turn of the century. In 1943 the house which had escaped destruction in 1904 was itself destroyed by fire. Attendance records of the Charles De Wolfe School show that young Leon Leslie was excused from school on January fourth because his house burned down. 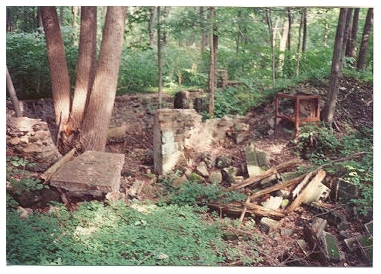 (Picture of Nicholas's home and the remains I found) The stone gatehouse and the carriage house are still there today. From march 24, 1902 until June 30, 1903 Leon M. Leslie was Postmaster of the Leslie Post Office, operated out of the stone gatehouse on his property. A letter with a Leslie postmark on it is rare. On the west side of Westwood Avenue, at 1019, is the Claudius O. Collignon house. Collignon built the central main part of the house, adding it (circa 1875) to his earlier two-story wing built circa 1860. This gave the house a most significant place in the manufacturing history of Old Tappan since it is the only example of a wealthy factory owner's home in the borough. It is also unique as the only structure in Old Tappan with Italianate style elements. The ornately carved raised scroll designs on the door and door surrounds are features of this style. More than likely these were executed by skilled woodcarvers and craftsman employed by the Collignons in their factory. I also found this in a book on the Hackensack. "Before the construction of the small reservoir both the Veldran Mill and the Collignon mill at Rivervale caused the Water Company a great deal of trouble in dry spells by holding back the whole flow of the stream so that their mills could be operated on half-day shifts. 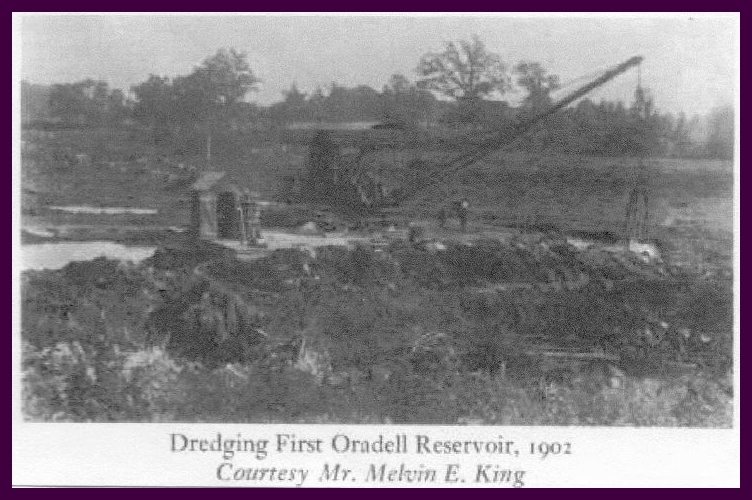 Mr. Melvin King, of Ordell, particularly remembers the friction between Mr. D. W. Chase of the Water Company and the Collignons over their practice of dumping sawdust in the mill-race to hold back water during droughts. The Water Company finally bought the Collignon property." ALSO INCLUDE A PICTURE FOR THE "COLLIGNON CHAIR GALLERY"